“Hey,” one of the more acclaimed tracks off of the Pixies’ generally acclaimed Doolittle, covers typical—for Black Francis, anyway—sacred-meets-profane lyrical ground, but musically, it’s one of those “other” Pixies songs. 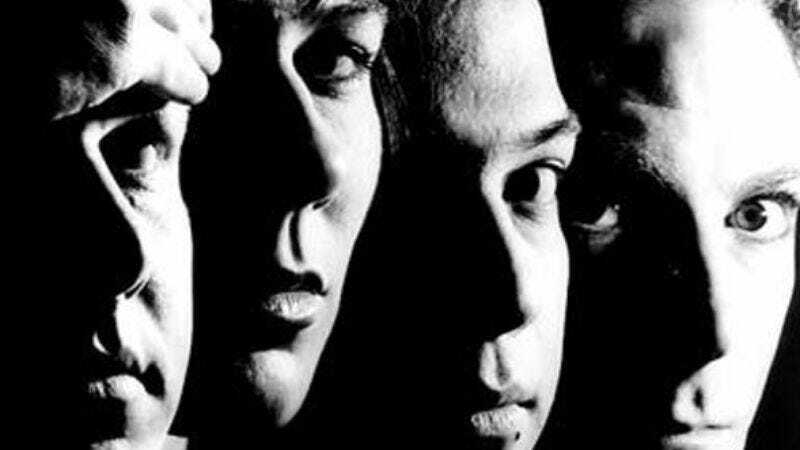 It’s still dynamic, but it’s not defined by the tension between loud and quiet like, say, “Gigantic.” Instead, “Hey” is the closest to funky you’re going to get from the Pixies, with a skittish groove that bounces off of Kim Deal’s bass line as Joey Santiago’s guitar scurries, then soars, over the surface of the music like a swan taking flight. The song flirts with religious imagery (“And Mary, ain’t you tired of this?”), gleefully combined with profanity (Francis’ favorite word, “whore,” shows up four times), and guttural grunts expelled with more than a little wantonness. Combined in the penultimate line, “‘Uh!’ is the sound that the mother makes when the baby breaks,” it just feels… sinful, somehow, even though nothing technically blasphemous is said. But like it often is in Pixies songs, the chorus is transcendent, with Santiago gliding over Francis’ painstakingly articulated “we’re cha-ha-a-ained, we’re cha-ained” and Deal’s monosyllabic moans. But there is no catharsis, and at the end of the song the guitar bends upward but the singers remain shackled to the ground.